Do you remember Rainbow Bob, Jovi? I just read it tonight to your big brother for the first time since you've been gone. It was so hard. We talked about how you loved that book. You'd always be upset while I got Cash ready for bed, but as soon as we all started reading it, you'd settle right down. Do you remember touching and feeling all the animal's stuff? I remember putting your hand on the lion's tail the most. I wish so bad you were here reading Rainbow Bob with us tonight. Maybe you were listening in from Heaven. We all miss you so much. We love you to Heaven and back. I can, honestly, say I've never felt God's presence more in my life than in these last few weeks. He's been there for me so much and He's so evident in everything that has happened with Jovi. I always thought I understood the sacrifice God made sending His only son for me... but I get it so much more now. The loss of a child is huge. It's so hard. There isn't even anything that can describe it. It's awful. I can't imagine knowing my child was going to die, even though He was going to save millions. It would still be dreadful. I'm so thankful God did that for me... for us. I wonder all the time what will become of this. I don't doubt for a second that God will turn Jovi's death into something good, but it doesn't change the terrible feeling that my baby is gone. This post is going a different direction... I'm wanting to share an amazing God story. 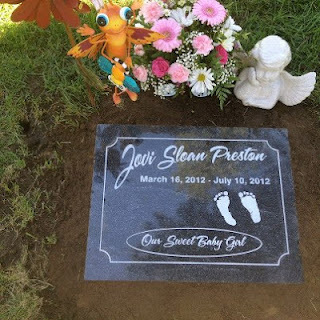 When Jovi first passed away, I was contacted by my aunt saying my uncle had a client who's granddaughter had just passed away from SIDS. I was told that the baby's mom wanted to get a hold of me and wanted my address. I was just in the beginning of everything. Everything was so crazy. I didn't pursue it and I'm sure I didn't act interested. I've, now, been wanting to reach out. Grief is so lonely. I have an amazing support system, but I've been yearning for someone who has been through this. It's so terrible that anyone else even has to go through this, but I'd been wanting to find someone who had. I've been putting myself out there. Emailing mom's of blogs I've found, joining online suppot groups, and even going to a local support group. I joined a support group through CJ SIDS Foundation. It's a national support group. It's new and there are around 15-20 other SIDS moms on it. I was looking forward to meeting everyone and being able to share experiences with someone who "get's it". A mom, Katrina, gave me her email address. After a few posts, I realized our grieving process is similar. Our philosophy on all of this is similar. I ended up emailing her. In a response, she realized where we lived and started to put everything together. Katrina is the same mom who tried to contact me when Jovi first passed away. We connected through a national organization when we live in the same state! She even journaled about my sweet girl. God, obviously, wanted us to connect. I'm so glad He did. We've emailed back and forth. We've talked on the phone for hours. I only hope this is the beginning of something good... I can't even begin to say how thankful I feel. It's so comforting hearing someone else say so many things I've said or thought. I am so thankful. Rowan and Jovi have SO many similarites. They both had the same hair. They were both the same age when they died. Jovi was 6 days shy of her 4 month birthday and Rowan was 8 day shy of her 4 month birthday. Rowan has a big brother, too. I would even say their little faces are similar. Rowan passed away during her afternoon nap just like Jovi. Rowan's mommy found her at 4:45ish pm. I found Jovi around 4:35ish pm. We just keep finding more and more things that are similar. I can't help but think that Rowan and Jovi are playing in Heaven. Maybe, they even helped get us together. I am sure Jovi knew her mommy needed a friend. I miss you so much, Jovi. I love you to Heaven and back. Isn't she so sweet? I have a special place in my heart for this little girl and I never even met her. 40 days seems like a million... it's been far too long since I've put a bow in your hair. I loved your hair. 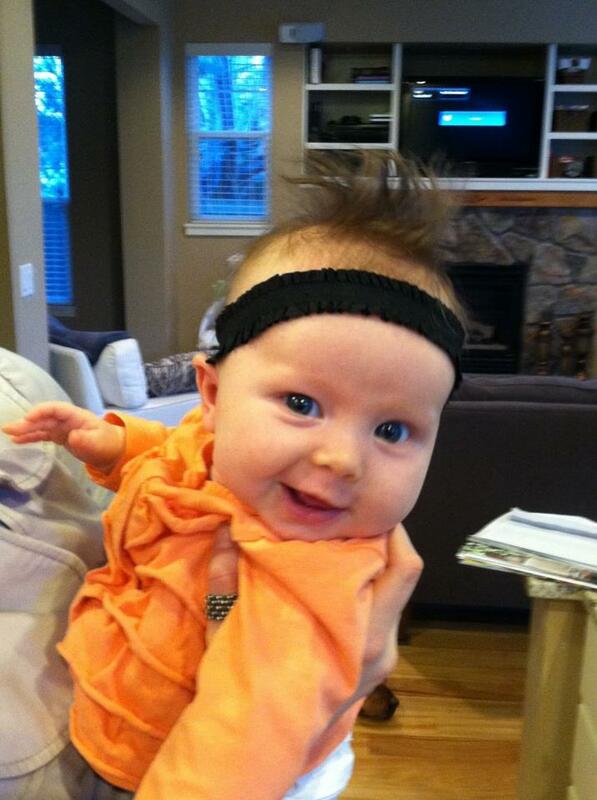 You had a lot of hair... You also had an awesome receding hairline. In fact, as you were born, the nurses asked if your brother had a lot of hair. They said you had a ton of hair. When you were placed on my chest, I looked down and couldn't tell you had a full head of hair because of your hairline... but when I looked you over closely I realized what they were talking about. You did have quite a bit of hair. As you got older, you hair not only grew longer, but started falling out, too. It still looked so cute. 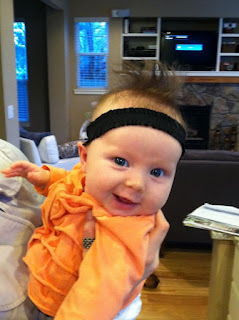 I often put headbands to cover up a lot of the bald patches. I still remember the excitement I felt when I realized that hair on top was long enough for a clip! I snapped several pictures of that day... and you gave me several funny faces. They are, also, some of my favorites. I miss you so much. I wish you were here. I wish I could just give you a big snuggle. What are you doing in Heaven? I love you, Joves, to Heaven and back. Oh, little girl, I'd rather be looking at those pretty blue eyes than looking at your headstone. Uncle J finished your headstone. He did a great job. Daddy installed it today. He did such a great job. I told him just to pay someone to do it... but he wanted to do it all by himself. He is so brave. You have the best daddy around. I know you were smiling as he did this for you. Thank you to Grandpa and Uncle S for helping, too. It's perfect for a perfect girl. While one month seems like an eternity since I've seen you... it also feels like I was snuggling you just yesterday. It's been far too long since I've seen that big Jovi smile. I hit some big milestones these last few days. I didn't journal in two days. Big. I didn't sleep with your blanket in my bed for 2 nights. Bigger. I haven't used sleeping meds for 3 nights. Bigger still. And... we had our first big milestone (or whatever you call it) since you've been gone... you've been gone for a whole month. Biggest. And, ya know what? I survived each and every one of them. There were tears. There were a lot of tears. BUT, I survived. I even smiled some! We've spent the last few days up at the cabin. It was so nice there. Nice to get out of town. Nice to escape for a bit. I think of you so much. I think so often of what life would be like if you were with us here. Life's began to feel like our new "normal". I hate so much that I'm getting used to you being gone. I'm getting used to you not being here. It's starting to feel more normal and I hate that more than anything. It's hard not to just get so mad that I have to feel that. That I have to find my way through life now without you. Mommy's shouldn't have to do that. But, I'm trying really hard. I'm trying really hard to live without you. I have your brother and your daddy and Jesus. With these guys, I can do it. They are helping me so much. 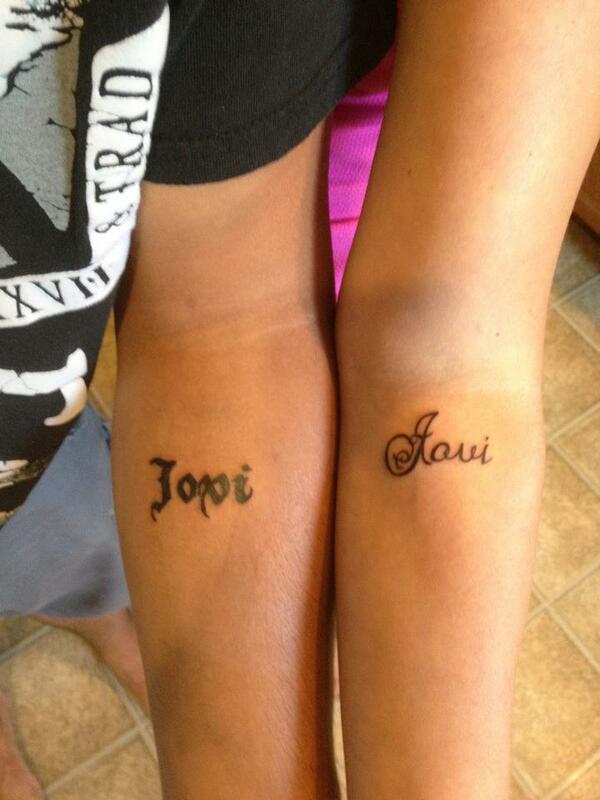 Your daddy and I got matching tattoos! We love them and love that we have something that feels like a piece of you that gets to go with us everywhere. Cashy misses you. He talks a lot about you. Lately, he's been saying he wants another baby in the house. I know you'd like that, too. I don't doubt for a second that you'll be an amazing big sister. Did you know Cash sleeps with Jovi Bear (a pink angel bear that came on flowers from your service) every night. I love that little bear, too. Jovi Bear even came to the cabin. I love it's like another piece of you that comes with us everywhere... a tangible piece. I miss you so much. I hate that you aren't here. I hate that life is getting into a routine without you. We are surviving. I know you'd be proud of us. I miss you so much, sunshine. I love you, Jovi, to Heaven and back! 29 days... feels like a million lifetimes since I've kissed those little hands. What a busy day. I got up and went for a run. I always do better with runs... then I went to work. Work went well. Your pediatrican is amazing... did you know that? She loves you and our family so much. I think she is taking your death hard. I think she is playing the what if game a lot... or the if only's. I wish she wouldn't. She is so good to you and our family and has really made me feel like you are important to her. I missed you today. I cried a little at work. I cried when she said she changed the way she practiced because of you. That means a lot... work was hard, but good. The people there are all so kind. I'm very blessed to work there. Anyway- I then went to lunch with Nana. We talked a lot about you. We always talk a lot about you... Nana is so great. She listens and she loves you so much. We went to Uncle S's and Aunt J's for dinner. It was great. Auntie J and I talked a lot about you and the baby they lost. Are you playing with A? Was she there to greet you in Heaven? I think today is the first day that I only felt like I couldn't breathe maybe a handful of times (so far). That's a HUGE feat. Huge. In fact, it's hard not to feel guilty. But, I have to remind myself... you'd rather me feel like that then feeling like I can't breathe all day. I am learning. I am learning and trying hard at life without you. I was talking to Cashy about you tonight. He asked earlier if Jesus could put a baby in mommy's tummy. He misses you so much. I think more than we realized. He loves you so much and is such an incredible big brother. We were talking about you and what you were doing in Heaven. He said you were playing... I asked him if he knew what you like to play with in Heaven? He got sidetracked and said to pretend my necklace was a spaceship and it was going to burn me with its flame... Oh the mind of a 3 year old. He really keeps us moving. He's really saved me. He's made me continue my life and not let it fall to pieces. He has a really special job and he's been doing soooo good at his big job. I miss you so much. I bet you are smiling as we speak and that makes me smile. Did you send me the pink sunrise this morning? It was beautiful. I love you, baby, to Heaven and back? 4 weeks... how can it seem like I was holding you just yesterday, but also feel like I haven't held you in years all at the same time? It's been far too long since I've twirled that chimpanzee hair between my fingers. What a morning. I missed you a lot this morning. Really a lot doesn't begin to cover it. The english language doesn't have much vocabulary for the words I've been trying to find lately. I'm wondering when I will wake up without a stomach ache in the morning. I miss you so much my tummy hurts. I hate the feeling. I hate that I have to miss you. That I can't just come in and pick you up when I'm tired of you sleeping. I would do that, you know. Just miss you so much I'd just go wake you up. I hate that I can't do that anymore. I can't kiss your cheeks. I can't kiss your lips. I can't nurse you... there are too many can'ts... way too many can'ts. Mommy's shouldn't have to do this. I shouldn't have to miss my baby so much that I hurt. I shouldn't have to pick out where you are going to be buried. I shouldn't have to be grateful for Uncle Justin making your headstone. Mommy's shouldn't have to do this... bottom line. I guess, today, I miss you so much I hurt. That's all I have today I think. I'm feeling frustrated and mad, right now. People keep saying grief has different steps... but I read someone who said it was like a river. It has all kinds of different twists and turns. It's not just a straight road. I flow between sooo mad, soo depressed, sooo sad, heartbroken, feeling ok, feeling hopeful, back to sooo mad... it's not steps for me. It's not days either. It's hours. One hour I feel so sad and my heart hurts so bad I can barely breathe. The next I feel hopeful about our future (never about your death), and then the next I'm so mad and find that this is entirely unfair. That's about where I am... And maybe will be for a long time. I'm also not sleeping well without the assist of any sleeping medicine. I'm working on weening myself off of them, though. What are you doing at this minute? I know you are having fun. I can't wait to see your face. I'll tell you that everyday. Send me a BIG Jovi smile tonight. I love you, Joves, to Heaven and back. 27 days feels like a million lifetimes (it sure doesn't feel like the blink of an eye). It's been far too long since I've kissed those pretty little lips (even though Nana always told me not to kiss your lips... I loved it). Hard day. I think I say everyday is a hard day... it is. Woke up and went for a run with Nana. That's a great start to my morning. I wish I would remember that...went to Cash's dentist appt. He did okay. Did you see him being a big fat grouch at first? Then, we went and visited your grave. I love to visit you, but it makes me so sad. Why do we have to visit our baby at the cemetery? Life is so unfair at times... We cried a lot. Your brother, thankfully, cracks us up. Even in the most depressing, raw sad times he can make us laugh. Thank you, Jesus, for him. Let me say that again- thank you, Jesus, for Cash. We watched a movie. I missed you the entire time. Had a really rocky afternoon. Then, Elise and Heather came over. That was nice. I love when people come over and create distractions for us. We have plenty of time by ourselves... the last thing we need is to be left alone more at this point. Losing you has created the most raw, intense, and unbearable pain I've ever experienced. Sometimes, I just choose not to go there. It's too hard and I don't want to feel it. Some hours (I'm not to days yet) I just choose to not let myself experience it. Please, don't worry that I'm not grieving... trust me... I am. It's just that sometimes I don't want to do it in that moment. And, I think that's okay. It's the way I'm coping. It's the way I'm learning to live without you. All life would be sucked out of me if I lived there every moment of everyday. Life has to go on. Losing you has been so hard, so difficult. It's been awful. It's been unreal. I've felt cheated. I've felt life is unfair. I've felt mad. I've felt ticked off. I've been so frustrated. I've been heartbroken. I've been sick to my stomach with grief and sadness... I could continue to go on... the emotions I've felt are only ones I've heard and hope that no one we know ever have to experience them. It is so difficult. Losing you has been the hardest thing ever. I don't want to lose my life, lose your brother's life, lose your daddy's life, lose our marriage.... we are coping to the best of our abilities. We are trying so hard. We are trying for you. It's tragic enough that we lost you... we don't need to lose anything/anyone else because of this horrific event. You'll be 5 months on the 16th. It's crazy how I never thought ahead. I never looked at milestones with you. I wonder how much of that was because you were my second, or because I always had a feeling in my heart that you wouldn't be with us for long. Or maybe because you gave us so many health scares... I never thought of you even being 5 months... I hope you get a big celebration in Heaven. I lived everyday moment by moment with you never rushing or hoping for the next moment. Just simply enjoying and loving what you were doing at that moment in time even if it was having a gigantar barf all over our living room or drenching company in your barfs. I loved every single moment of everyday being with you and being your Mommy. I hope you realize that. It's crazy to me how I always have thought that we would teach our children all about Jesus... now I pray He is teaching you about me and that you haven't forgotten my love for you. Or that you remember you time here. You remember how much you are loved. That you remember how I strived to do what was best for you. I talked about you a lot today. It feels my heart more with joy than with sadness when I talk about you. I cry because you died. Because you are not here. Not because I'm discussing you. You've taught me more than anyone. You have taught a lot of people. Today, a friend told me that you gave her inspiration to find joy in even the most terrible moments with her babies. That made my heart feel just a little bit happy. Because I feel that everyday. You taught me that. You really taught me that. I have really tried to become a better person. To live life to the fullest everyday (even though sometimes my heart literally feels like it can't beat it misses you so much). To love Jesus. Even in the midst of one of my most awful, raw, terrible, heartbreaking, I-can't-breathe moments... I still love Jesus. I still believe He is the king of kings. I still love Him. I still believe He is good. God didn't take you away. He is with me. He is grieving the loss of you with me. He is heartbroken with me. He is making the best of this situation. He welcomed you with loving arms and is taking care of you until your mommy can come. He loves you so much, baby. He loves us so much. Our future is good. Our life is good. We will survive this. Jesus loves us. God is love. I miss you so much and wish you were in your bassinet next to me. I am giddy with excitement for the day I get to see your beautiful face in Heaven and be able to hug you again. I hope you know just how much you are loved. I love you, Joves, to Heaven and back. 25 days feels like a trillion. It's been far too long since I've snuggled you. Another rough morning. I did realize the sleeping medicine I was taking (Ambien) makes me feel disgusting and makes me have freaky dreams. So, I'm flying solo tonight. No sleeping pills for the first time in, well, 25 days. It's probably for the best. I missed you more than words could describe today. We went boating. All I could think of the entire time was how I wished you were there with us or that I couldn't even go because you couldn't go. I'd much rather stay home with you, baby. We, also, went to the Street Fair and Taste of CDA. It was so hard without you... passing all the girl headband booths and cute hats... last month I would have stopped and looked at them for you. It was so hard. I also wished I was worrying about you and about how I would have been freaked about you being in the sun. I wish I was... I wish is in my vocabulary a lot these days. To sum it all up, I wish you were here. Auntie Jo and Uncle Justin hung out with us tonight. It's so nice to have them over. My heart is so broken. It's going to be broken forever. A piece of it will always be missing and will always hold a special spot for you. People say we are doing great. I just think I've realized I have give your brother the most fun and normal life that I can. He doesn't like to see me sad. Not to mention you really showed me to live life to the fullest. To love the most that I can... I don't want my life to waste away or our family to fall apart. It's been hard enough on all of us losing you... we can't lose anything else. I'm trying really hard to make the best of this super awful (words can't even begin to describe terrible) situation. What are you doing right at this moment? Is there mountains in Heaven? I miss you more than anything... I love you, baby, to Heaven and back. It seems like a lifetime since I've held you. It's been far too long since I've made you smile. What a rough day. I had a really hard morning. All I could think of all morning long is what if I had heard your alarm as soon as it went of? Would it have made a difference? Would you still be here today? I was taking a shower and praying really hard. Crying out to God saying I was sorry... feeling like I'd failed you. I suddenly felt like no matter what I did or would have done, you would still be in Heaven. It had to have been God. I suddenly felt an overwhelming peace when I was soooo depressed and heartbroken not two seconds before. Whether it was July 10th or July 15th... you were not meant to be with us long. I believe that with my whole heart. I am not sure what I think about God taking you... I wonder if something about you was "wired wrong" to put it simply. Something in you was not correct and if July 10th had taken a different course, another day could have played out exactly like July 10th. As much as I miss you, I'm thankful I never have to live that day again. It was the worse day of my life, but it will NEVER happen to this family again. In Jesus name, we will never experience a tragedy like this ever again. It is so crazy how July 10th was so normal. I worked. I worked out at the gym... then you were gone... it's so crazy how life goes on as "normal". I can't just stop time for a few days to grieve the loss of you. To attempt to get some grasp on this... I have to keep moving. Maybe that's a good thing. I'd imagine it is. I've always been a go-getter. I hate staying home couped up in the house all day. I hate dwelling on things. I hate complaining. I've always just put on my good face and attempted to make the best at what as been given to me. I can say I've continued that same mentality. My heart is more broken than I could say. I'm devastated you are gone. I cry for you daily. But, I'm trying the best I can to deal with this in the best way I know how. I'm trying so hard to be brave. To be strong. To not let life fall apart. To give your brother and daddy the best of me and to keep life going as normal as possible for your sweet brother. I think you'd be proud. Today wasn't super eventful. Cash got an Echo and an EKG to make sure he has no underlying cardiac conditions (in case we missed something in you). He did so great. I'm sure you were watching and smiling. We hung out at Nana and Papa's. I miss you so much, baby Jovi. I wonder what you are doing right now? Are you dancing? I can't wait to see that face. Life isn't the same without you and it never will be. Daddy and I decided to try sooner for a baby than we'd originally thought. Let Jesus know we'd love to be blessed with a strong, healthy baby who of course, can never, ever replace you. You will forever hold a special place in my heart. A big part of my heart says "Reserved for Jovi". I hope right now in this moment you are so happy. I know you are feeling loved and your life in Heaven in more incredible than I can ever imagine. I love you to Heaven and back.